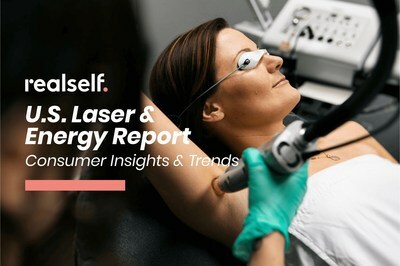 SEATTLE, July 12, 2018 /PRNewswire/ -- RealSelf, the world's leading online marketplace to learn about cosmetic treatments and connect with doctors and other clinicians, today released its inaugural RealSelf U.S. Laser & Energy Report revealing consumer interest, patient satisfaction based on the proprietary RealSelf Worth It Ratings, and emerging trends within the laser and energy device market. A record 94 million people visited RealSelf to research elective cosmetic treatments in 2017, and laser and energy technologies have played a crucial role in the overall growth of medical aesthetics. Interest1 in laser and energy device treatments on RealSelf grew 10.5 percent in 2017, and five of the top 10 most researched minimally invasive categories on RealSelf last year included treatments using a laser or energy device. "New laser and energy technologies have brought innovative treatment solutions for a range of services, from body contouring and facial treatments to tattoo removal and vision correction," said RealSelf Founder and CEO Tom Seery. "RealSelf attracts millions of consumers every month and has become a barometer of aesthetic interest and demand. Based on consumer interest and review patterns we see on RealSelf, we expect to see interest in treatments using laser and energy devices continue to rise." Fat reduction was the most researched minimally invasive treatment category on RealSelf in 2017,2 surpassing popular categories like injectable fillers and toxins. Nonsurgical fat reduction devices work by damaging the structure of fat cells, allowing the body to process and remove them with minimal downtime. Laser and ultrasound-assisted liposuction treatments work by liquefying fat before it's removed, allowing for a less invasive alternative to traditional liposuction. Fat reduction treatments accounted for nearly one-third of the top 10 most researched branded laser and energy treatments in 2017.3 CoolSculpting took the number one spot, followed by Smart Lipo (#2) and SculpSure (#7). Consumer interest in vaginal rejuvenation treatments, which help address changes in vaginal health often caused by childbirth and menopause, increased by 17 percent on RealSelf from 2016 to 2017. Branded devices ThermiVa and MonaLisa Touch saw the fastest year-over-year interest growth, increasing 45 percent and 28 percent respectively. Vaginal rejuvenation treatments also yield high patient satisfaction, with four devices named among the most "Worth It" laser and energy device treatments4: diVa Vaginal Therapy (98% Worth It Rating), FemiLift (94% Worth It Rating), MonaLisa Touch (92% Worth It Rating), and ThermiVa (91% Worth It Rating). Interest in newly developed vaginal rejuvenation treatments is also on the rise, with four new devices included among the top emerging treatments5: Geneveve (+80%), Ultra Femme 360 (+68%), FemTouch (+36%), and diVa Vaginal Therapy (+23%). Facial lasers, which address skin concerns ranging from sun damage and acne scars to overall skin texture, were the fourth most researched nonsurgical treatment category on RealSelf in 2017. Interest in new-to-market facial lasers is trending up, with three brands named among the top emerging treatments6: Resurfacing Perfected (#6) with 40 percent growth, Excel V (#8) with 25 percent growth, and Pico Genesis (#10) with 18 percent growth. To view the complete report please visit www.realself.com/press. RealSelf is the leading online marketplace for people to learn and share experiences about elective cosmetic procedures and connect with the right providers. Offering millions of photos and medical expert answers, 10 million people visit RealSelf each month to find out which treatments and providers live up to their promise of being "Worth It." From simple skincare to highly considered cosmetic surgery, RealSelf makes it easy to discover what's possible and find the right provider.